On April 30, 2016, at 1000 eastern daylight time, a Universal Stinson 108, N8660K, was substantially damaged during a runway excursion while landing at the Calverton Executive Airpark (3C8), Calverton, New York. The private pilot was not injured. Visual meteorological conditions prevailed and no flight plan was filed for the personal flight that that was conducted under the provisions of Title 14 Code of Federal Regulations Part 91. The flight departed Lufker Airport (49N), East Moriches, New York at 0930, destined for Westmoreland Airport (49NY), Shelter Island, New York. The pilot stated that during climbout at an altitude of about 1,200 feet mean sea level, the engine began to "miss" as though it had a "partially fouled spark plug." He decided to perform a precautionary landing at 3C8 and attempt to remedy the problem on the ground. During the rollout after landing, a wind gust lifted the right wing and the airplane ground looped and came to rest in the grass on the left side of runway 32. 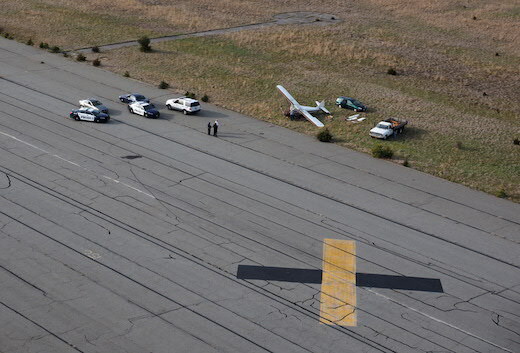 Brookhaven Airport (HWV), Shirley, New York, was located about 7 miles southwest of the accident site. At 0956 the reported weather at HWV included wind variable at 5 knots, clear skies, with 10 statute miles of visibility. Runway 32 at 3C8 was constructed of asphalt and concrete and was 10,001 feet-long by 200 feet-wide. An examination of the wreckage by a Federal Aviation Administration (FAA) inspector revealed that the left wing strut was bent, the left main landing gear was folded under the fuselage, the left wing tip was damaged, and the fuselage floor structure sustained substantial damage. The pilot indicated that the engine had performed similarly on previous occasions, and he was able to correct it by performing an engine run-up. The airplane was fueled with automotive gasoline, for which it was approved; however, the applicable supplemental type certificate specifications did not permit the use of automotive fuel containing ethanol. The FAA inspector reported that the pilot had been purchasing automotive fuel that contained ethanol, and employed a "water shake" method in an attempt to remove the ethanol from the fuel before transferring it to the airplane fuel tanks. 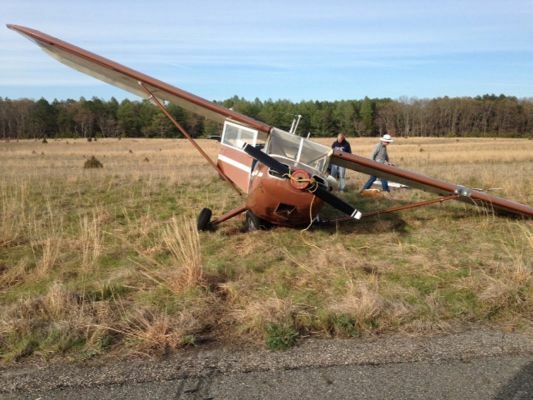 On April 30, 2016, at 1000 eastern daylight time, a Universal Stinson 108, N8660K, was substantially damaged during a runway excursion while landing at the Calverton Executive Airpark (3C8), Calverton, New York. The private pilot was not injured. Visual meteorological conditions prevailed and no flight plan was filed for the personal flight that that was conducted under the provisions of Title14 Code of Federal Regulations Part 91. The flight departed Lufker Airport (49N), East Moriches, New York at 0930, destined for Westmoreland Airport (49NY), Shelter Island, New York. Haven’t heard of the “water shake” method to run ethanol fuel in an old aircraft engine. I have seen pilots use automotive oil to save money, and having an engine failure soon there after. This is why I don’t just jump in and fly with someone I do not know well.